What's Infrared Heating? Why is it better than conventional heaters? Imagine standing outside in the middle of winter, the sun is shining, but the air temperature is near to zero. You still feel the warmth of the sun on your face – this is infrared. 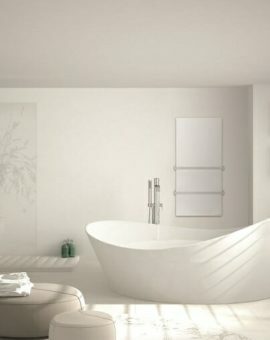 Unlike convection heating (imagine a radiator) that heats the air, an infrared heater warm solid objects directly. The infrared travels unimpeded out from the heater until it hits a solid object, which then absorbs it and warms up. Infrared is radiation that is beyond the visible spectrum. Importantly it is the opposite side to harmful Ultraviolet and Gamma rays, so it poses no threat to human health at all. In fact, we ourselves produce Infrared rays in small quantities and it has been proven to have many health benefits. It is incredibly wasteful heating a room, just so the air gets warm enough for you to feel warm. 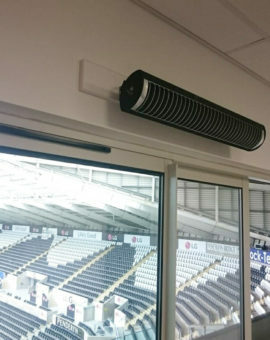 You have to heat many cubic metres worth of ‘unused’ air in the room and even when you do this, much of this warm air heads up towards the ceiling so you miss out. With infrared heating systems, you don’t need to heat all the air in the room to feel warm, infact, you turn the panel on and as soon as it gets up to temperature (normally just a couple of minutes) you will begin to feel the warmth. 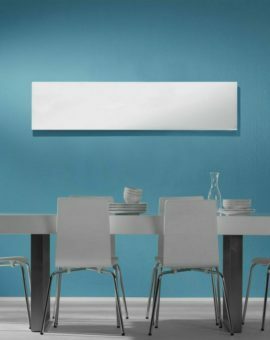 IS INFRARED HEATING BETTER THAN A GAS CENTRAL HEATING SYSTEM? On the face of it gas is far cheaper than electricity (which power our infrared heaters). Gas is about 3.5p/kWh while electricity is 14p/kWh, so yes in very simple terms a gas system is cheaper to run. It is worth pointing out a couple of things though, firstly as we have mentioned, with a gas central heating system the radiators need to get warm to heat the rooms. That takes far longer than with one of our panels, so more gas is used comparatively. Another important thing to consider is when you want to heat a single room with a boiler, the boiler still needs to fire up – yes not very much hot water will be needed, but the whole system needs to come online. If you have infrared heating in different rooms (and this is an advantage of other electrical heating systems too), you can simply turn the heater on in the room required. The final point is that infrared heating is actually pretty simple technology; there is no pipework to run, no annual boiler checks needed. Therefore the cost of maintaining your infrared heating system is far lower. This is backed up by the fact all of our panels comes with a minimum 5 year warranty, and our Inspire range come with a 10-year warranty. We have been working in the infrared heating market for many years now and have tried and tested many different infrared-heating products. Our expertise in second to none and we pride ourselves on our efficient and speedy customer service. We appreciate that you have a huge choice when it comes to choosing your heating system, but call us today and see what we can do for you!